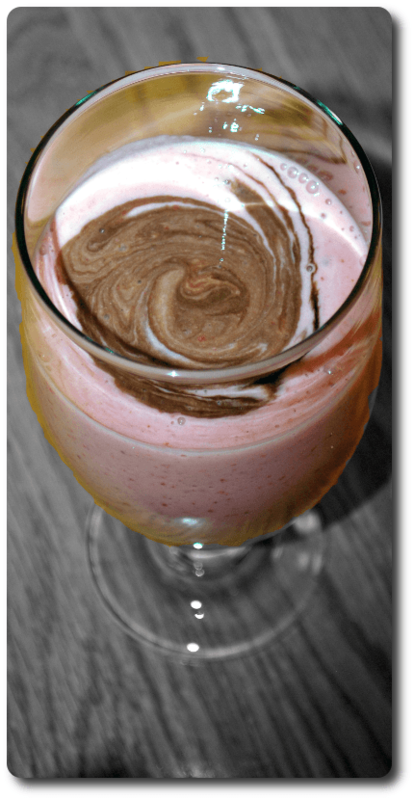 Indulge your sweet tooth with fresh fruit and a touch of dark chocolate syrup in this strawberry smoothie. Peel banana. Wash and hull strawberries. Add yogurt, banana, and strawberries to blender. Blend to your desired level of consistency. Pour into glass and add chocolate syrup. Stir briefly with spoon as desired. We've experimented and found that a little bit of fresh banana enhances both the flavor of the berries and the chocolate. Less is more; you might even halve the banana, according to your taste. Dark chocolate works much better than milk chocolate. The latter just doesn't have enough flavor to keep up. You can experiment with adding the syrup to the blender before blending, but our tastes prefer the minimal stirring of the spoon to a fine blending.